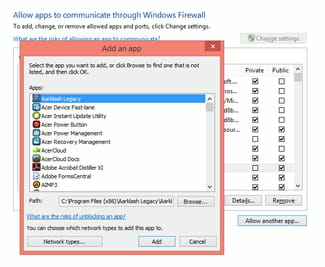 As a security measure, all PCs use firewalls to protect your computer from receiving unwanted network traffic and to keep your apps from relaying information to the outside world. While this is a very necessary precaution, in some cases, you may want to allow your apps to communicate beyond the firewall. In this case, you will need to add an exception to your system. 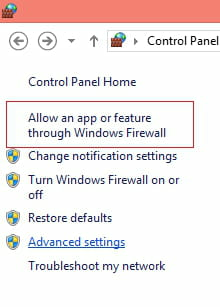 In this article, you will learn how to add an exception to your firewall settings, which will allow your apps to communicate through a firewall. You can configure these options via the Firewall settings. Click the Control Panel, or press the Windows key + X > Control Panel. 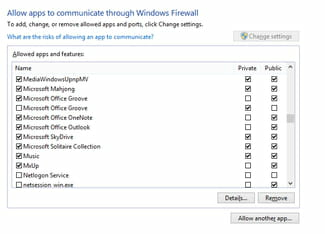 A list of applications currently allowed through the Windows Firewall will be displayed. Published by deri58. Latest update on October 12, 2016 at 10:21 AM by Olivia Long. This document, titled "Allow or Prevent App Communication Through a Firewall," is available under the Creative Commons license. Any copy, reuse, or modification of the content should be sufficiently credited to CCM (https://ccm.net/).